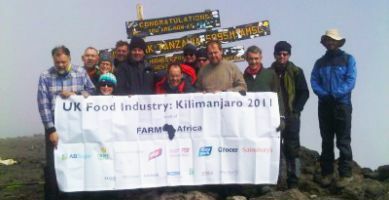 Food for Good began when ten intrepid UK food industry leaders climbed Mount Kilimanjaro to raise money for Farm Africa. Their challenge proved to be an inspiration and united the food and hospitality industry behind this important cause - to help fight poverty in eastern Africa. Others were inspired to follow and now hundreds of people across the industry have got behind the campaign that is going from strength to strength! 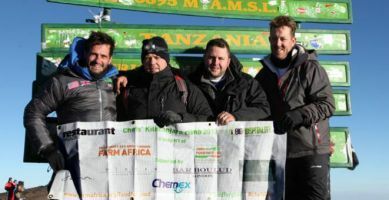 In September 2011, an impressive group of food industry leaders led by Richard Macdonald and Charles Reed conquer Mount Kilimanjaro in Tanzania, the world’s tallest freestanding mountain. 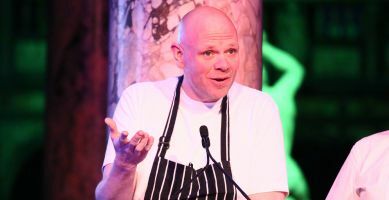 The group kicks off Food for Good by raising a massive £250,000. 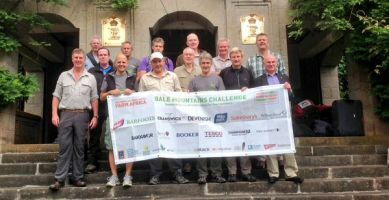 Before the climb they are inspired by a visit to one of Farm Africa’s projects in nearby Babati where the charity is supporting 4,500 sesame farmers to achieve yield increases of 75% and a life-changing 180% increase in their income. 2013 sees even more businesses pledge their support for Food for Good including The World’s 50 Best Restaurants List who appoint Farm Africa as their official charity partner, Barfoots of Botley host a Summer Ball and staff at Cosine organise a huge range of fundraising activities. Can you imagine digging a swimming pool by hand? 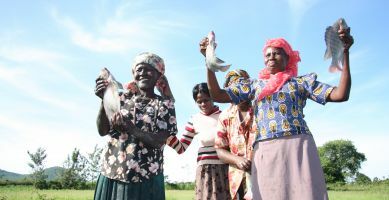 In May 2013, a group of women industry leaders worked shoulder-to-shoulder with the members of the Afula Women's Group at one of Farm Africa's projects in Kisumu, Kenya, hand-digging a swimming pool-sized fish pond in just three days! 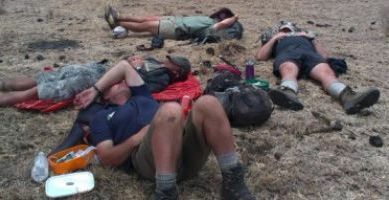 In September 2013, Richard Macdonald and Charles Reed corralled a second group of food industry leaders to take on a unique challenge and a true test of endurance, trekking 145km over six days on uncharted paths through the Great Rift Valley in the Tanzania Highlands. Funds raised by the team brought the 2013 Food for Good total to £500,000! Michelin-starred chef Jason Atherton’s designed a one-off menu at the first ever Gala Ball which brought together over 200 Food for Good supporters at London’s V&A Museum to raise over £140,000. 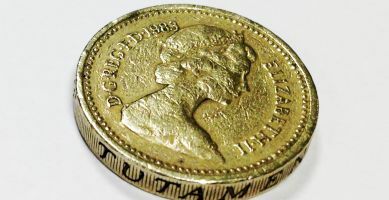 In November 2014 we announce that the campaign reaches a phenomenal £1million, helping 15,000 people to grow themselves and their families out of hunger. 3 days, 9 women and 90 beehives to build. At Farm Africa, we call that a challenge! 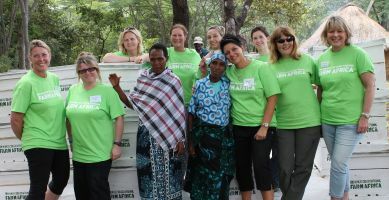 In June 2015, Judith Batchelar led a group of senior women from the UK food industry to Tanzania to complete the 2015 ‘The Big Beehive Build’ challenge. 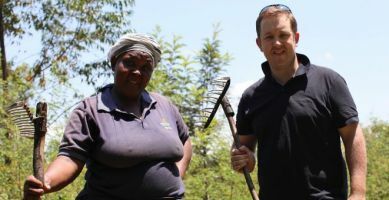 Working alongside the Erri community in Tanzania the group built an apiary of Langstroth beehives to kick-start profitable and sustainable honey farming businesses for the Erri beekeeping group. 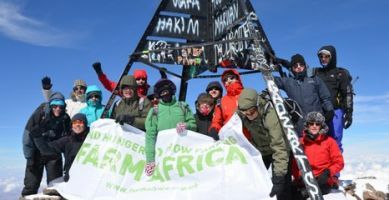 In November 2015, a group of senior members of the food industry set off on a 117km trek, hiking across valleys and scaling mountains - including the second highest peak in Ethiopia, Tullu Demtu. Not only did the team successfully summit four peaks, they smashed their fundraising target, raising a huge £140,000 to help farmers like those they met to escape cycles of poverty and hunger. 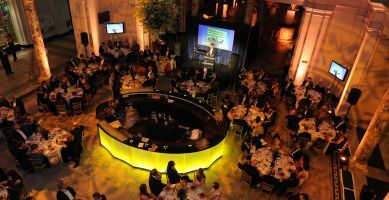 On 21 April 2016, Farm Africa hosted its second gala ball at the Victoria & Albert Museum in London. With three Michelin-starred chefs designing an exclusive menu for over two hundred guests, we raised over £135,000 to help farming families in eastern Africa fight poverty and hunger. Food for Good sets its sights on raising more each year to help Africa's farmers grow a brighter future. What will you do in 2017 to help us lift a further 70,000 people out of poverty? Find out how you can get involved with Food for Good Find out more!